The addition of bespoke driveway gates can instantly transform your home. Perhaps you have a beautiful garden which is fit for all seasons but it requires a finishing touch, or maybe you just want to add an extra layer of security and privacy to your home for you and your family, whatever your needs, bespoke driveway gates from B&K Timber will instantly enhance your home exterior. We pride ourselves on manufacturing high quality driveway gates which are solid, secure and durable whilst also being elegant, warm and welcoming. At B&K Timber, we have been lovingly crafting bespoke gates for customers in Staffordshire and surrounding areas for over three decades. In this time, we have built a reputation on delivering expert craftsmanship . We have also ensured that we source only sustainable raw materials such as red wood timber grown in Scandinavia. Today, we are proud to say that all of our bespoke driveway gates are made from PEFC and FSC certified wood. At B&K Timber our main goal is to deliver our customers with high quality, environmentally friendly bespoke driveway gates. In addition to being crafted to the highest standards, all of our bespoke driveway gates are also very stylish! You can choose from elegant swan shaped sweeps such as our beautiful Winterly Driveway Gate. Alternatively, if you prefer subtler convex shapes you may like our Astbury Driveway Gate. Whatever style you choose, bespoke driveway gates from B&K Timber guarantee to enhance the aesthetic of your home whilst also increasing its security. All of our driveway gates also come in three shades, red cedar, brown or clear preservatives. With our online garden gate builder and our helpful tips, creating your own bespoke driveway gate could not be easier. Simply browse our fantastic range of driveway gates and submit your requirements. 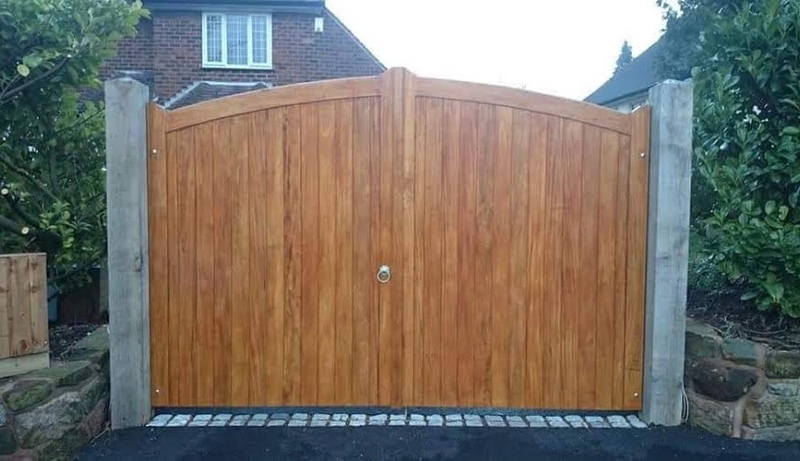 If you would like more information about our bespoke driveway gates in Stoke on Trent or Staffordshire, or you have any questions, please contact a member of our friendly team who will happily advise you.